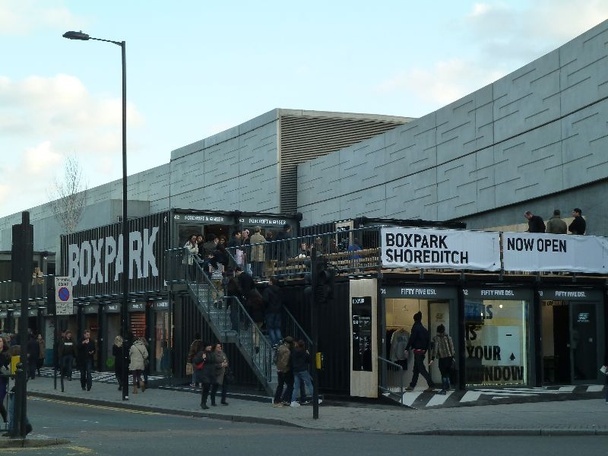 This article A Walk Through London’s Boxpark, the Temporary Mall That’s Probably Coming Soon to a City Near You in the The Atlantic magazines Cities section talks about Boxpark, a containerized mall in london. The structure are modified shipping containers with added insulation and fittings to make them into stores. The whole thing was assembled on an empty lot in a few days and will be removed when construction starts on the building that’s going to go there permanently, in 5 years. This is the next phase of the pop up store phenomenon, a pop up mall and there no longer needs to be an empty storefront available. Also this would work to experiment with new store concepts, new locations, and even just to ‘freshen up’ or ‘change up’ a stale section of real estate. Also a dig for the Atlantic, which can be cranky liberal but is generally pretty even-handed and has some very good articles. Their web page is pretty darn good and the Cities section has some fascinating off the beaten track articles. This entry was posted in Future and tagged Buildings, change, Future, The Atlantic by Sci Fi Engineer. Bookmark the permalink.